OVERVIEW: How did Paul Hamm and Carly Patterson become the top gymnasts at the Olympics? Each came from behind. One fell into the judges' laps, the other started out at the bottom and worked her way to the top, winning by two-tenths of a point. How did this happen? Were the Sentinels of Olympic Vigilance assisting, or did the competitors do it all by themselves? What lesson did they send to the Children's Children's Children? GROUND ZERO PLUS 1075 DAYS--New York, NY, Friday, August 20, 2004--The Athens Olympics continues to prove that the Beast of Terror is always beatable if you stand up to his fangs and claws. That’s what happened the other night in Athens when the world's best ranked male gymnast landed heavy off the valult and fell into the judge’s laps during the men's Gold Medal all-around individual competition. It was like driving a Formula One into a brick wall during the Grand Prix. A pall cast over the announcer's voice as he moaned that America's Great Gymnastic Hope probably was out of Gold Medal competition, and, would be lucky if he made it in the top three. Bookmakers who had piles of bets favoring the gymnast suddenly started to count their money after Hamm's score of 9.137 should have finished him. Side bets gave big odds he would not have a snowball’s chance in Hell to garner the Gold, and lucky to eek out a Bronze. 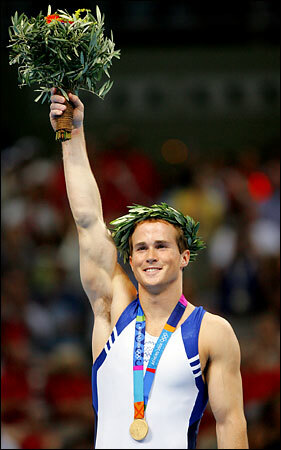 But Paul Hamm, 22, looked the Beast of Olympic Terror in the face after his disastrous fall. He could have succumbed as many athletes do to the Fear, Intimidation and Complacency because to many the Gold Medal he worked so hard to achieve was now out of sight. But Hamm saw things differently. He called upon the Sentinels of Olympic Vigilance. His mission wasn't singularly to win the Gold Medal, but to do his absolute best as an athlete. He wasn't going to be beaten by the Beast. He knew it was about what was inside him--about his Character of Competition. Part of the Character of Competition involves setting examples for future generations. A gymnast or any competitor at the highest level who faces Fear and crumbles signals to all the Children aspiring to compete that winning is everything, and when the chance of winning is thwarted, just gives up. But a competitor who faces disaster and then recovers and competes as though nothing had happened develops in the aspiring child the ideal that competition of the self is more important than the winning of the Gold. Ultimately, it comes down to the Conviction a competitor has to do his or her best, regardless of whether the payoff from the outside world is there or not. Hamm chose to compete for the Children’s Children’s Children. His true Olympic nature defied the Beast of Olympic Terror and told him to show the world that despite the falls, the mistakes, the errors…and, the hissing of the Beast of Olympic Terror who can, if allowed, make a competitor feel like a “loser” when the Gold Medal slips away...that one's Olympic Vigilance can overpower all assaults of Terrorism from within. Hamm chose to link hands with the Sentinels of Vigilance and called upon his Courage to overpower his Fear, and his Conviction. He displaced any grains of Intimidation his fall might have caused, and, he asked for the ability to do the Right Action for future generations by competing at his best even if it meant he might not win the Gold or even medal. Competing for the sake of doing his best, Hamm excelled in the next set of exercises. He posted a 9.837 on the parallel bars. He was flawless in the final one. He again posted a 9.837 on the high bars. At the same time, his competitors, seeking the Gold, made mistakes. Hamm’s superb athletics rose to the top. By just a few thousands of a point - .012, he achieved a magical chapter in Olympic history—he won the Gold Medal. But did he do it alone? Perhaps Hamm didn’t win it by himself. Perhaps the Sentinels of Vigilance helped him win it. Perhaps all the Sentinels formed a great ring around him and kept the Beast of Terror at bay. This doesn’t discount Hamm’s individual effort, it enhances it. There comes a time in anyone’s life when he or she must call upon forces and sources outside themselves to help in times to trial and tribulation. For years, Hamm had worked hard, practiced, taken his Vows of Athletic Vigilance and fought off the Beast of Terror’s attacks that tried to limit his sights and make him think the impossible was impossible rather than the impossible probable. In those moments following his fall into the laps of the judges, there is little doubt Hamm saw the Beast of Olympic Terror hissing in his face. The Beast of Terror jumps on people's deficits and does his best to defile human character and pure achievement. But the Beast was in a for a surprise. His taunting of Hamm was a signal to the Sentinels of Vigilance to rise up. They charged forward, surrounded Hamm, and from there on, Hamm’s skill as a champion never faltered. The lesson from this experience is worthy of note. Do we keep fighting for what is right even when we make mistakes--when we falter, when we fall our faces--or do we pick ourselves up and dust off the errors and go forward with more resolve, more commitment? The same might be said of America's top woman gymnast, 16-year-old Carly Patterson. Carly beat the world ranked favorite, Svetlana Khorkina of Russia, by two-tenths of a point to become the first American woman to win the overall competition since Mary Lou Retton did two decades ago and win the individual Gold Medal. Carly started out eighth after the first of four exercises. She battled her way to the top. Unlike Svetlana Khorkina, who is consider the queen of gymnastics, Carly didn't brag about winning the Gold or state as Svetlana did that the "Gold belonged to her." Carly's final score was 38.387 over Svetlana's 38.211. Carly competed much as Paul Hamm did--with the Sentinels of Vigilance coaching her, reminding her that she was role model for children who needed to learn to fight the Beast of Terror's Fear, Intimidation and Complacency. In sharing with our children about the Olympics...the key is to remind them that those who won the Gold Medal didn't win it because they sought it alone. Svetlana sought it alone and missed it. The Gold Medallists were Sentinels of Vigilance, working with many others--coaches, trainers, friends--to overcome the countless obstacles the Beast of Olympic Terror tosses here there along the way. Telling a child how Paul and Carly overcame their Fear, Intimidation and Complacency is a a much more important story than about them winning the Gold Medal. These competitors took the Vow of Olympic Vigilance. They were competing for the future generations. You can too. 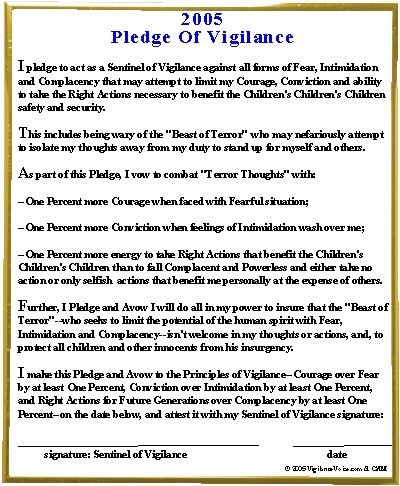 Take the Pledge of Vigilance today. Be a Sentinel of Olympic Vigilance. Go To August 18 Story: "Terrorists En Route To Wall Street Charged With Conspiracy To Cause Fear, Panic And Disruption"